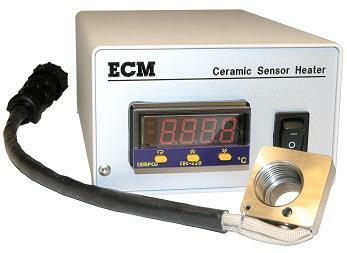 The ceramic sensor heater kit controls the mount temperature of a ceramic exhaust sensor. By doing this, the effects of an exhaust sensor’s sensitivity to changes in mounting boss temperature (i.e. drift due to changes in exhaust pipe temperature) can be reduced. The BTU200 Sensor Heater is recommended for use with the NOx 5210 Analyzer and NOxCAN Module that uses the P/N 06-01 NOx Sensor. It is not required for NOx5210t, NOx5210g Analyzers or NOxCANt, NOxCANg Modules that use the P/N 06-02 or P/N 06-03 NOx Sensors. www.ecm-co.com (408) 734-3433 © 2017 ECM. All Rights Reserved. Specifications subject to change without notice.